(Daily file photo by Keshia Johnson) Jacob Berkowitz grapples with an opponent. The senior has emerged as a key wrestler for NU this season. Nearly halfway through the season, Northwestern has more than doubled its win total from last year. And in addition to the Wildcats’ early success as a team, individual wrestlers made an impact last week at the 54th Annual Ken Kraft Midlands. NU (5-2, 0-1) started its campaign hot, winning its first four matches by a combined score of 145-21. With the return of 174-pound sophomore Johnny Sebastian, who suffered a season-ending shoulder injury last year and the emergence of 197-pound senior Jacob Berkowitz and junior 184-pounder Mitch Sliga, the Cats have handled a number of opponents with ease. The trio of Sebastian, Berkowitz and Sliga are a combined 28-3 this season, and filled the void left by superstar Jason Tsirtsis, who transferred to Arizona State before the school year for academic reasons. As a freshman, Tsirtsis won the NCAA Championships for the team. Along with the team’s veteran core, the Cats’ freshmen have impressed thus far. Anthony Rubinetti (125 pounds), Jason Ipsarides (133 pounds), Alec McKenna (141 pounds) and Braxton Cody (165 pounds) have all become consistent starters. Despite the emerging starpower from both veterans and newcomers in dual play, it was a pair of unattached wrestlers who stole the show at the Midlands. Sebastian Rivera (125 pounds) and Ryan Deakin (149 pounds) have wrestled unattached this year, preserving their redshirt eligibility, but the pair brought NU to the podium at the Midlands. 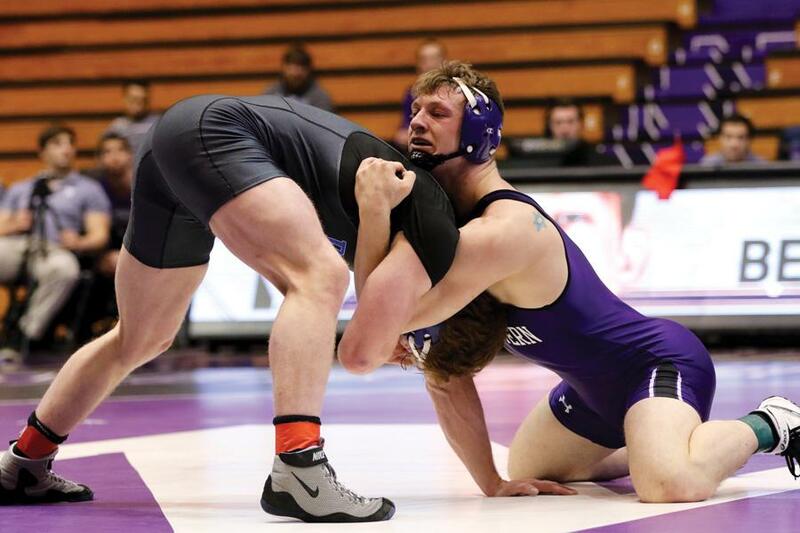 The tournament, which Northwestern hosted starting Dec. 29, pits the best wrestling schools in the nation against each other. Representing NU, Rivera and Deakin rose to the challenge. Deakin placed third in his weight class and Rivera placed fourth in his. Deakin won his third-place match against Oklahoma’s 16-seed Davion Jeffries. Prior to advancing, Deakin downed No. 3 seed Alfred Bannister of Maryland and No. 6 seed Joey Delgado of Oregon State. Meanwhile, Rivera advanced to the semifinals of the tournament before losing to Tim Lambert of Nebraska, the No. 2 seed and the eighth-best wrestler in the country. Rivera was on the verge of claiming the bronze, leading 11-0 in the third-place match, but the freshman sustained an injury midway through and was unable to finish. With the focus shifting back to dual meets, the Cats’ balance of talent should help them continue to improve from last year’s disappointing campaign. They’ll have the opportunity to recover from a slight skid — NU has lost two of its last three dual meets — when they match up with Purdue on Sunday. With momentum from the Midlands, the Cats will look to get back on track and avoid a collapse after a strong start.